MiFi Mobile Hotspot - Without a Contract! What's MiFi?! It sounds like WiFi, and although it's related, it isn't the same thing. Mi-Fi is an amazing innovation that is often referred to as a mobile hotspot, and I'm confident that the discussion below will answer all of your questions! I think Mi-Fi technology was a great idea, and although it took time for prepaid plans to come to market, the wait was well worthwhile, and there are now plethora of options! I built this page when postpaid providers were just starting to catch on; it really is amazing how far prepaid wireless data options have come. Signing up for my free Prepaid Wireless Tracker ezine is the easiest way to make sure that you hear when new prepaid Mi-Fi plans become available, or when critical pricing changes happen. 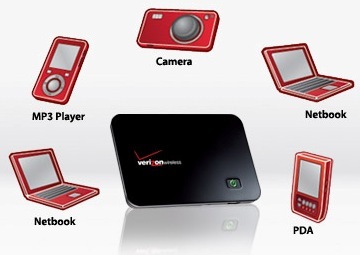 Best MiFi Plans - Compare No Contract Plans Now! MiFi is a mobile hotspot. The next logical question is: "What's a mobile hotspot?" Hotspots are often referred to as Wi-Fi hotspots. Follow the link to Prepaid Wi-Fi to learn more about this technology. Once you understand Wi-Fi technology, whether a hotspot at a local coffee shop, or using your wireless router at home, add to that Prepaid Wireless Broadband technology. In other words, combine Wi-Fi with cellular technology, and you've got yourself a mobile hotspot! I also want to note that the term "MiFi" is actually a registered trademark owned by Novatel Wireless (now Inseego Corp). They've never revealed the origin of the term, however, it's believed to short for "My Wi-Fi". In fact, a number of years ago Novatel reached out to me via email to request that I stop using the term. Due to the fact that this site gets so much traffic to these pages, they felt that I was infringing on their trademark. I kindly explained that I'm educating and promoting their technology (and terminology), and assured them that this site doesn't pose any threat. That seemed to appease them as I haven't heard from them since! Essentially, take a cellular mobile broadband modem that you would normally plug into your computer (ex. a USB modem), unplug it, and put a battery inside so that you don't have to get power from your computer. Now take that standalone device and add Wi-Fi technology to it. Now you can connect your computer to the mobile Mi-Fi hotspot using your computer's Wi-Fi technology! How many computers can connect to a MiFi mobile broadband device? Typically five to 10 devices can connect to a Mi-Fi hotspot at the same time. Smartphones with hotspot technology can also act as hotspots. In fact, it doesn't have to be a computer/laptop that you connect to your hotspot. It can be any Wi-Fi enabled device such as a cell phone, iPod, iPad, tablet, etc. Initially providers limited connectivity to no more than five devices. Why five devices? Well, it's most likely to do with capacity. By capacity I mean that the more devices you have connecting to the same Internet connection (in this case a MiFi device), the slower the connection will become. For most people just surfing the Web and checking email, you won't likely notice any affect on speed when five devices are connected. Could you connect to more? Sure! Would you notice a difference in speed with 10 devices? Maybe, maybe not, but five was the standard for a long time until 4G became the standard. Also, keep in mind that wireless carriers also have to consider the cost impact. In theory, you could have five people in a small office sharing the device for Internet access. Before MiFi, they would have to buy five modems and five plans, whereas now they only have to buy one device and one plan! So if wireless carriers allowed 10 or 20 people to connect at the same time, not only would the user experience start to deteriorate (i.e. slow connection speed), but they would lose a lot of money! The reason for the shift to 8-10 simultaneous connections now, is due to the fact that we have so many devices we now carry around. Add a few friends you're hanging out with, and you would quickly surpass the legacy five device limit. Can I keep it in my bag? Yes! A Mi-Fi device is just like a Wi-Fi router, and can be accessed from ~32m (or 120ft) away. And because it has its own power source (i.e. battery) you can leave it in your pocket or bag, or in the corner of your office and still access it. If you're on the go, you'll probably find that you use the battery feature a lot. If you're using it all day though (ex. in a remote office or spending all day in a bookstore), you'll want to plug it in. You can either plug it directly into the outlet in the wall, or you can plug it into a powered USB port on your computer. Note, however, that many computers don't provide power to devices plugged into USB unless the computer itself is plugged in. The bottom line is that you have options. Plug it into your computer, keep in in your pocket or bag running on the battery, or plug it into the wall. Also keep in mind that the distance from which you can access it will also depend on the size of the device and its built-in antenna. Generally speaking, you want to try to keep it within a few arms lengths in order to achieve maximum speeds. There's also usually a sleep feature when it's in battery mode. What this means is that when you're not accessing the Internet for a period of time, the device will enter a sleep mode to conserve battery power. In the MiFi devices I've seen, you have to push the button on the mobile hotspot to wake it up. You can usually disable this feature, which can be inconvenient if the device is not within arm's reach, but will mean that your battery will die faster if you don't let it sleep when not in use. They typically last four hours with continuous use, or 40 hours on standby. You can also get an external battery pack, and simply keep it plugged into there. You might be asking yourself whether or not your neighbors, or the guy next to you in the bookstore can steal your connection. The answer is no! You have access to administration rights to the device that allow you to specifically give permission to the devices that are allowed to access your mobile hotspot. Just remember that you need to set this up; by default, the network will be open for anyone to access. NEXT - Mobile Hotspot: The Best of Both Worlds!